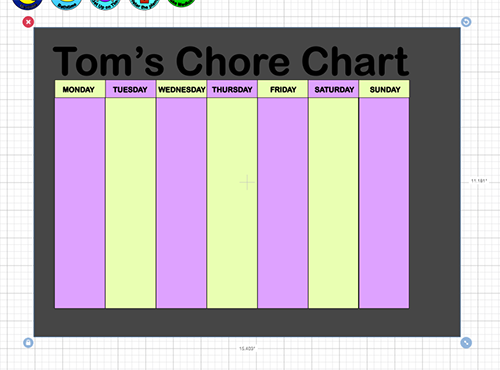 Chore charts – or *reward charts*, if you want to be a bit more motivational – are very popular at the moment. Last week Adele was in the press exalting their merits and explaining that she uses one to get her four-year-old, Angelo, to behave himself! Ours is a brightly-coloured durable piece, made from vinyl applied to a metal baking tray (!) 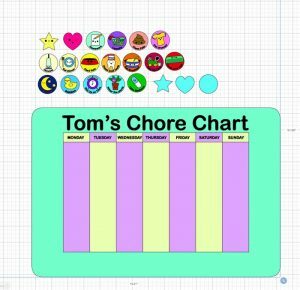 – and it’s fully customisable, so not only will it bear your child’s name, you can change the words to make it a bit less intimidating (as we say – ‘Reward Chart’ might be more motivating!) 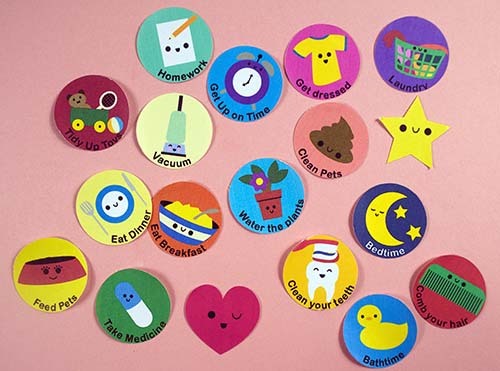 It also comes complete with EIGHTEEN magnet designs, in cute kawaii style, to encourage your little one to do everything from homework to going to bed at a reasonable time! 🙂 You can also just make stickers out of them, if you prefer! Vinyl in four colours (the sizes will vary on size and dimensions of the vinyl you have – however, an A3 (or ledger) size sheet will be large enough for the backing, and A4 (or letter) size sheets more than enough for the other three colours if you’re using a tray the same size as ours). We used Oracal 651. Import the svg – it’s quite heavy (there’s a lot of details on those kawaii drawings, believe it or not!) but it will load if you give it time! (PLEASE NOTE: The turquoise star, heart and circle are there in case you have a printer that (understandably!) refuses to print on magnetic paper. 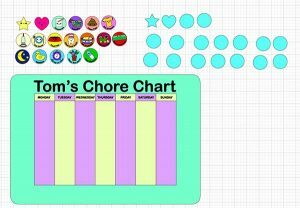 If this is the case, then you will need to duplicate these pieces – you’ll cut as many of them as you’ve cut chores/stars/hearts, and you’ll affix sticker versions of the chores to them, rather than just print magnetic paper and cut around it). If you click on the images, you’ll see (as in the image above) a bounding box surrounding everything). This means that it’s all grouped together, and you need to change some things first. So, you need to ungroup. In the menu in the right-hand margin, click on ‘Ungroup’ (or, alternatively, right-click and select it from the drop-down). If your printer DOES print magnetic paper, then you can delete all of the turquoise shapes! Now, unless you have a son named Tom, then you need to change the text. The text here is only a guide to show you the size we used – you’ll need to type it in yourself. Which of course means you can use another font if you like! I prefer simple, classic fonts, though, so I used Arial Rounded. To create your text, click on the ‘T’ symbol in the left-hand margin. A white box (well, rectangle!) will appear. Start typing and your message will appear. Once you’ve type the message you want, click on ‘Font’ in the top menu bar, and you’ll get a choice of fonts to choose from. Once you’re happy with the look, then resize the box so that it’s the same width as our title. You can now delete our title, and position your title in place. 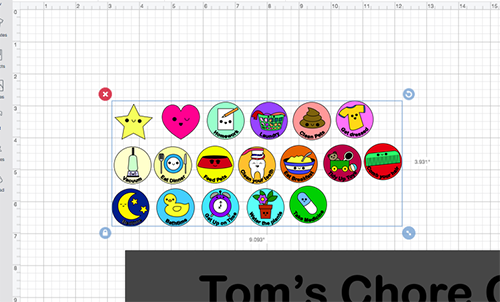 (We’re sticking with Tom though…as we’ve made the board now!!!) If you also want to change the size and font of the days of the week, too, then now’s the time to do it, using the same process. 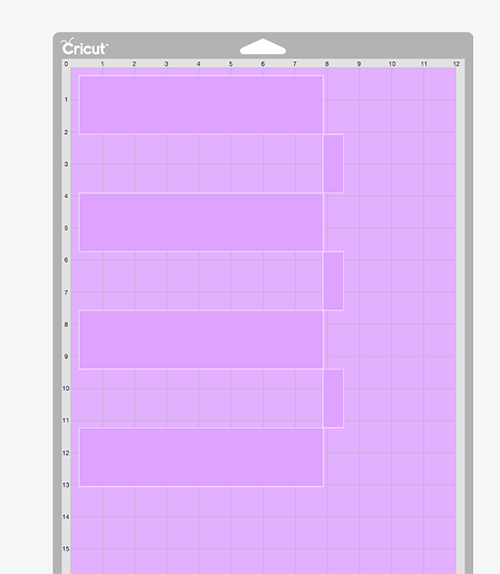 When you’ve decided what size you need your background rectangle to be, click on ‘Shape’ in the left-hand margin, and select ‘Square.’ In the top margin, click on the padlock above the figures in the ‘Size’ section, and you’ll be able to change the proportions of the square to a rectangle. Resize it (either by dragging the arrows symbol on the bottom-right corner, or typing the numbers in the ‘Size’ section in the top menu bar). Drag it to one side. Delete our green rectangle. 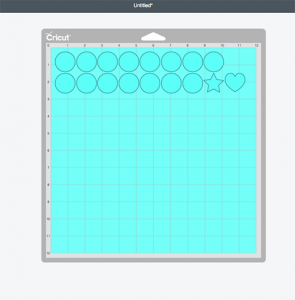 Click and drag over the both the title and ‘grid’ area so it’s surrounded by a bounding block (as shown below). Click on ‘Group’ in the right-hand margin. 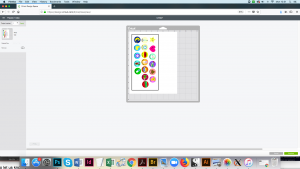 Drag the symbol at the bottom-left corner of the bounding box to resize the box to the size you need, using the rectangle you created as a guide, if it helps. 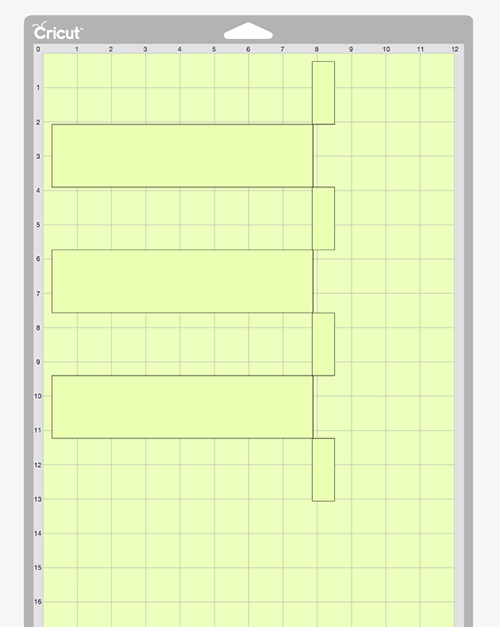 Drag your rectangle over the title and grid. It’s likely to disappear! So click on ‘Arrange’ in the top menu bar and choose ‘Move to Back’ from the drop-down menu. You’ll be able to see everything – but it’s likely to look a bit off-centre. Now everything will be a bit more tidy! Click on the shift key, and select your title (e.g. 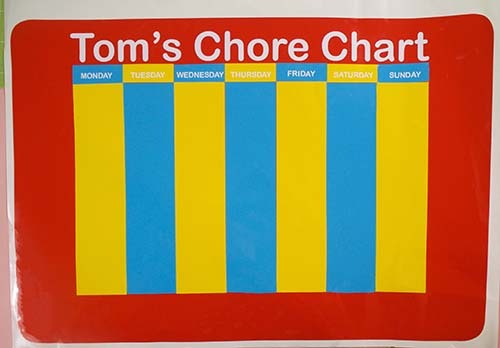 ‘Tom’s Chore Chart’) and, one-by-one, each of the days of the week. Once all are selected, click on ‘Attach’ in the right-hand margin (from the very bottom of that menu). This will ensure that they are all cut out in order. Click on the shift key and all of the pink rectangles (or whatever colour you’ve changed them too!) and click on ‘Attach’ in the right hand margin. Repeat for the cream rectangles. In the right-hand margin, you’ll see all of the elements that make up the magnets are selected. Choose ‘Flatten’ from the very bottom of that menu, and this will set them up for ‘Print and Cut.’ Please give this some time, as it’s quite a large file! You’re now ready to start cutting! PLEASE NOTE: This is a large file, and – especially if it is undergoing a lot of updates at the time – Design Space can struggle with it. 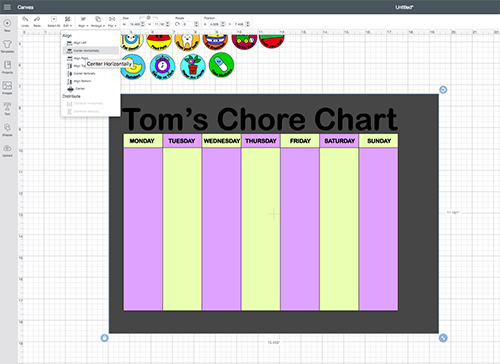 If this recurs, then we recommend that you delete sections from your canvas and print things out in smaller sections, e.g. just the magnets, or even a smaller group of magnets. We find the order that the elements come through in can be quite random, so don’t worry if these are in a different order! This sheet is the magnets! As we ‘flattened’ them earlier, we set them up to be Print and Cut. Now, as we mentioned earlier – what you do with these depends on your printer. Does your printer print magnetic sheets? A lot don’t. If it does, print this section onto the magnetic sheets. If not, then print this section on sticker paper (we’ll later position these on blank magnetic shapes). Either way – the first step is going to send this file to your printer, so make sure it’s connected up. 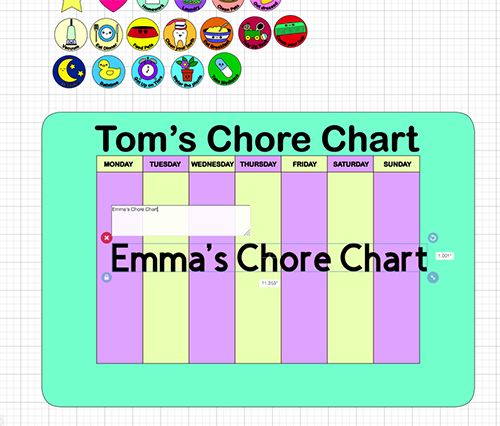 Once you’ve printed the chore circles (if you have any problems, don’t worry as you can go back to the ‘Printing’ step by clicking on ‘Printed’), you will be invited to select your materials – this’ll be either magnetic sheet or sticker paper. 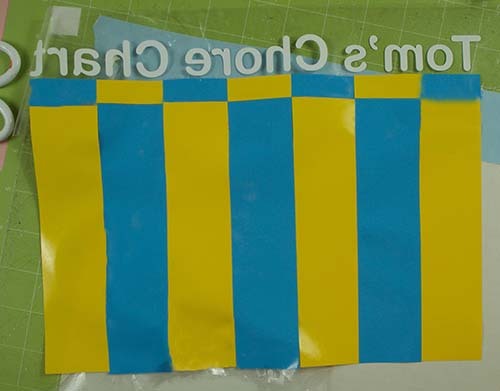 If it’s the former, I have found the ‘Magnetic Sheet – 5mm’ the best setting, even for normal magnetic sheet. (If you’re printing on stickers then choose the ‘Stickers’ setting). Make sure lighting in the room is good, and load the relevant blade and mat. If you’re cutting the big backing rectangle, it will probably crop up now (or, if it’s too large, you’ll be cutting it by hand!). Either way – the process is now complete – you’re ready to assemble everything! Take your time ‘weeding’ your vinyl, as some of those letters are rather small! Once done, take the text section and position it so that the left of your title (e.g. the ‘T’ in Tom’s, for us!) lines up perfectly to the edge of the first box, but also that alternate days of the week match their boxes at the top. Now, position this above the second lot of vinyl columns, so that the other days of the week have those colours behind them. Take time to match the edges carefully – this can be rather tricky! To eliminate air bubbles, I’d suggest starting at the centre and moving outwards by pressing down in gradually-larger circular movements). Once this is done, you can carefully position it on top of the large rectangle you cut – again, being careful with those pesky air bubbles! (If you have any stubborn bubbles, pierce a tiny hole with a pin and push the air out firmly. Now, again moving from the centre and pressing down with your finger/nail with outward circular movements, attach this sheet to the baking tray. Fold it over the sides. 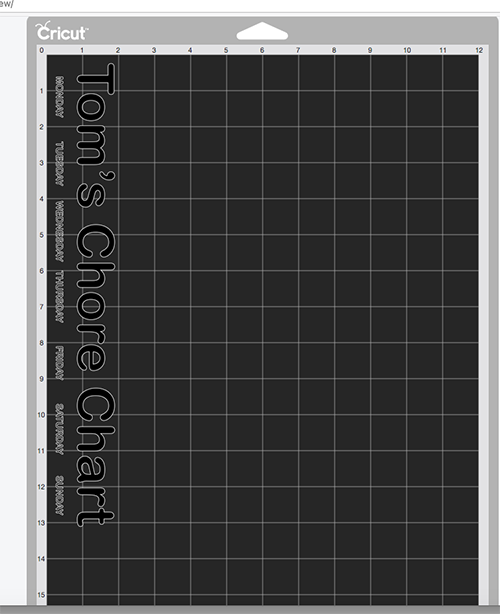 You’ve now got your chore chart! You just need to create the magnets. If you used a magnetic sheet, you’ll already have them. If you used a combination of the sheets and sticker paper, simply position the circular (and heart and star-shaped!) stickers to their corresponding shapes cut from the magnetic sheet. That’s it! 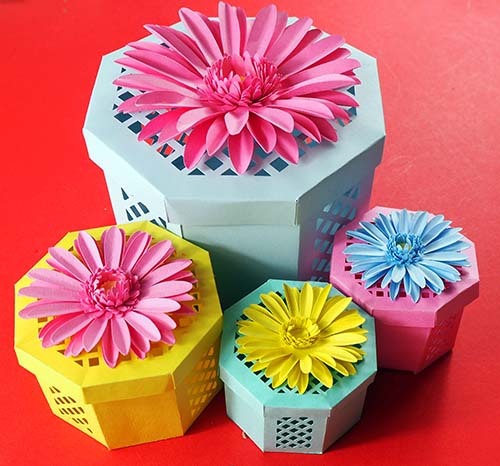 Create as many magnets as you want and position them down either side, ready for daily use!